This tutorial part is about how to localize core Python plugins so contributors can translate the user interface. 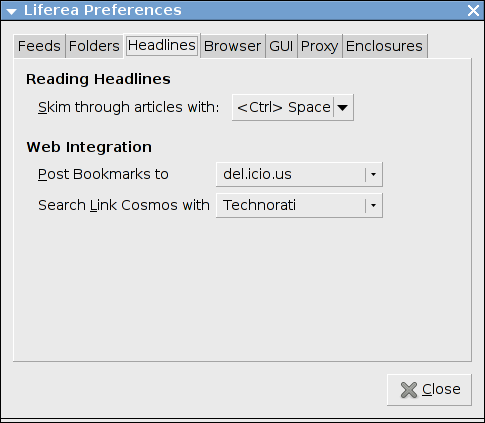 For a good plugin example have a look at the Liferea plugins headerbar.py where Robbie Cooper added gettext support. And now everywhere you need it you can use translated literals, e.g. Note the _() style which is the gettext wrapper to replace text with translations. This is another bug fix release which resolves several usability problems. You can download the release tarball at github. 1.12.5 is a bugfix release. It includes an important bug fix that solves a possible endless loop on using "Next Unread" which several users experienced as endless high CPU usage. If you are affected by this: please upgrade! Release 1.12.4 brings small bug and security fixes. Let's continue the plugin tutorial. The last installement was on how plugins work and how to create the boilerplate for a new plugin. Now let's look into how to access Liferea UI elements and how to modify them. Using the plugin boilerplate for a Liferea.ShellActivatable (a plugin that activates once the Liferea shell, which as an object comprises the entire main window UI, has been setup) we get a member variable named "shell"
in general when you want to modify existing UI elements or add extra elements to the UI above list should be a good start. This is all done on activate, nothing needs to be done on deactivation. Some time ago a fellow Liferea user asked about documentation on writing Liferea plugins. I see the need and the benefit and want to start doing so with a series of blog posts that later can be compiled into a tutorial to be included on the website/sources. The important point is: by Liferea using GI (as all GNOME applications and many other GTK applications do now) plugins can be written in practically any scripting language. Most users seem to favour Python and all current plugins included with the Liferea sources are in Python. Note that this tutorial will also focus on Python only. How are plugins triggered from within Liferea? Ok, I can write a script in Python! How will Liferea run it and when? This is where libpeas comes in, which is a basic library to implement a plugin system. If you click the preferences dialog and switch to the "Plugins" button you see a dialog provided by the PeasGtkPluginsManager class of libpeas. Detection, activation and configuration of plugins is handled by libpeas. Now for the "When?" question: To properly allow applications to hook plugins into different parts of the applications libpeas allow an application to define one or more so called "Activatable" interfaces. For simplicity for Liferea I decided to only support a LifereaShellActivatable interface. This means all plugins are activated together with the LifereaShell instance (src/ui/liferea_shell.c). This class represents the main application window holding all widgets. So when your plugin gets activated all widgets exist and you can access everything like extending or modifying the GUI, changing settings, everything you can think of. that are used to implement two important features (GNOME keyring support and a simple media player). Feel free to use those two, but be aware that they work differently and activate at other times and not just once as the LifereaShellActivatable. The activate() and deactivate() methods are required by libpeas and provide you with the starting points to do stuff. By fetching the "Liferea.Shell" instance you gain access to the main window. Using this you can both lookup widgets or other Liferea classes like the Liferea.FeedList to perform actions against business objects of Liferea. Where to put my plugin script? Note that paths can be different with different XDG settings. When writing and testing don't bother installing the plugin in the package directories. Just put it in ~/.config/liferea/plugins, fire up Liferea. More about how to check for activation, debug problems and handling enabling/disabling in the next installment of this tutorial! Yesterdays release (1.12.3) includes a new plugin that allows you to completely switch out the toolbar/menubar window decoration for a GNOME style GTK headerbar. If you are unsure wether you like this, just enable the plugin to have a look, disable it again and you will get back the default look. The plugin is not perfect, there are many UX considerations that are probably not yet right. If you use the plugin extensively let's work together on it. Also don't be afraid of the code, for now it's just 80 lines of Python waiting for your new ideas! Today sees a new 1.12 release which addresses some long-standing user concerns. One being accidentally marking all your headlines as read, we have no a confirmation dialog. Another issue addressed is that of custom download tools. The list provided is not always sufficient so we now provide a CLI command you can enter to use you favorite downloader. A lot of refactoring also allowed us to provide a GTK headerbar plugin for all fans of GNOME style window decorations. Here is another How-To on GTK/libpeas plugin development. This time it is on how to use the GTK Inspector to dive into application details. Note the second column 'Name' of the "Objects" table containing all those widget names we covered in part 2/3 of the tutorial. If you select the 'CSS' tab you get a inline editor to try style changes in Liferea. If you make modifications successfully you can save them to disk and make them permanent. and notice the immediate changes. You probably also noticed that widget type names are not 'GtkTreeView' but 'treeview', not 'GtkButton' but 'button' and so on. Just lowercase and strip 'Gtk' and you have the selector name. Welcome to a new installment of the plugins tutorial! Todays issue will cover menu modifications. This allows you to add new menu options for features you introduce with your plugin. Before diving into the example code we need to cover some theory. GTK3 provides several APIs to build menus but for Liferea plugins only one of them is exposed: the GtkUIManager. The above snippet defines an menu item that you can merged into the UI by calling a method like gtk_ui_manager_add_ui_from_string(). Note that above definition only says that there ought to be a menu action with internal action name "New2Action". So we still have to define this active and bind a callback. Please note that the GtkUIManager property is only exposed starting with Liferea version 1.12.2! You probably noticed the "ToolsMenu" and "MainwindowMenubar" ids in the XML snippet above. Here is a list of all menu ids in 1.12 which also can be found in src/ui/liferea_shell.c. This is a bugfix release for the recent 1.12.0 release. Thanks to Leiaz tackling several complicated issues. Most prominent is a hopefully solved issue with the pane sizing with maximized window. Last but not least we have Italian and Indonesian translation updates. Finally I wanted to say thank to all of you who starred the github repo after the 1.12.0 release! It really makes a difference to know how many people are out there caring. Get a tarball or checkout the code from Github! This is the first release of the new stable release line 1.12. Many thanks to all the contributors and package maintainers that made this possible! * Upgrade to WebKit2: This is an important security improvement! Please help fixing any leftover bugs and UX issues! Nowadays it is hard to know how many users are left out there. If you like the release of 1.12 show it by giving the project a star at Github!!! This is another 1.12 release candidate fixing bugs and updating a lot of translations. Support for Reedah and InoReader. Some minutes ago I'v added Leiaz extensive change for switching to Webkit2. This is great news because for quite some time Webkit1 has not seen any security updates anymore and many applications still on Webkit1 expose there users to quite some risk. The most important change is Webkit being multi-process. For applications using Webkit this means they have to talk to the background process to scroll, copy text, get context menues and other stuff. The Webkit2 way to do the talking is to write a Webkit extension that is loaded when the background process starts which allows us to send DBUS commands. As for performance it seems faster. But you might want to try yourself! I'm not sure about how many users are aware of the feature, but I'm certain it is worth to know about as it saves a lot of clicking and pointing with the mouse. If you are a keyboard user it's worth knowing about the hotkey to skim through headlines. By using this hot key you can navigate the article pane and the item list view at the same time. As long as the article pane allow vertical scrolling it scrolls down. Once you reach bottom Liferea jumps to the next unread article. When you are not satisfied with the menu key bindings defined by Liferea do not despair it is easy to change them! Note how only the "ToggleItemFlag" and the "PrevReadItem" line have defined key bindings, while "NewVFolder" and "SearchMenu" don't. To change a key binding first remove the semicolon at the start of the line and then adapt or clear the key binding field. Choose prefixes like "<Primary>" (for Ctrl), "<Alt>", "$lt;Shift> as needed and append the key after it. This variant is hard to document as different distributions have different setting dialogs. Some expose a setting to enable life editing of key bindings. Once this is enabled you can open a menu hover over a menu option and press the accelerator you want to assign. It should show up instantly.